Members of the Gulf Coast Power Association (GCPA) gathered in Austin, Texas, on October 4 and 5 for their annual meeting and a celebration of the group's 20th anniversary. Hatched as the Gulf Coast Cogeneration Association in 1984 with 12 engineers, GCCA admitted Cogen Technologies as its first corporate member. During the 1980s, the upstart cogenerators competed with the much larger investor-owned utilities. In the '90s, non-utility generators, independent power producers, and exempt wholesale generators were born with the creation of the wholesale market by the Energy Policy Act of 1992. At the meeting, more than 350 attendees shared their assessments of the successes and failures of deregulation in the Electric Reliability Council of Texas (ERCOT) market. Most considered the Texas model a shining success that established the "truest" electricity market in North America. Addressing the theme of the meeting—"Building on Success: Adapting to the New Challenges in the Texas Electric Market"—almost all presenters called for three things: additional generation capacity, renewable energy, and demand response. The guest speakers were considered the rock stars of deregulated power in Texas. Before a packed house over lunch, they shared what they"d learned in the recent past and gave their predictions for the future. Non-ERCOT. These are end users in those portions of the state outside ERCOT's electrical wiring diagram—in other words, customers of SWEPCO, SPS, Lubbock Power & Light, Entergy, and El Paso Electric whose rates are still regulated by the PUCT. ERCOT, retail open. These users are in portions of the state where retail competition was established in early 2002. Distribution grids there are owned by AEP, Centerpoint, and TXU. ERCOT has more than 100 registered retail providers. ERCOT, retail closed. These customers live in areas served by municipal and co-op utilities that choose not to offer retail choice. Two of the largest munis are operated by the cities of Austin and San Antonio. Hudson discussed the issues that keep him awake at night and, in particular, his concern that new generating capacity won't get built in time. ERCOT experienced record peak demand of 62,396 MW on August 18, 2006 (Figure 6 and table). Forecast demand for 2025 (plus a 12% reserve margin) is 100,000 MW. But the long-term supply/demand gap is actually greater than 30+ GW because much existing capacity is already 20 to 30 years old and thus will be need to be retired and replaced. Turning to the shorter term, Hudson predicted that reserve margins in Texas will fall into the single digits between 2007 and 2009 due to the time it takes new projects to get permitted and constructed (Figure 7). Of the 8,500 MW of old capacity that have been mothballed, 1,100 MW have already been returned to service, and chances are that more will be called back between 2007 and 2009. Hudson also expressed concern about the "gas hangover" from Hurricanes Katrina and Rita. In ERCOT, the current price to beat (PTB) ranges from 14.5 to 16.3 cents/kWh. The best retail prices range from 12.5 to 12.9 cents/kWh. The current 20-day forward rolling average price for gas is $7.74/mmBtu. Hudson then asked, if gas-fired generation produces more than 50% of the electrical energy in ERCOT and wholesale prices are falling, why hasn't the retail price per kWh fallen as fast? He encouraged all retailers to take the gloves off now and to get aggressive on price. Remember, Hudson added, on January 1, 2007, the PTB officially goes away. So on that day the incumbents (TXU and Reliant are the gorillas) can reduce their prices to win back lost customers and attract new ones. All eyes also will be on Entergy this coming New Year's Day, because that's when the utility will submit its "transition to competition" plan to the PUCT. The commission says it hopes to give a thumbs-up or -down to the plan within 180 days. Hudson also touched on how to import capacity from outside ERCOT and how to pay for it. He noted that it would probably make sense to extend ERCOT's transmission line 2 miles to pick up 1,000 MW—but not 1,000 miles to pick up 2 MW. Somewhere in the middle lies the right economic balance. In September 2003 the PUCT ordered ERCOT to develop a nodal wholesale market design. Implementation is expected to deliver improved price signals and dispatch efficiencies as well as direct assignment of local congestion. The transition to the nodal market will require significant changes to ERCOT's current business model, including the day-ahead market, reliability unit commitment, real-time or security-constrained economic dispatch, and congestion revenue rights. ERCOT's cost to purchase and deploy computers and software could exceed $200 million by 2008. ERCOT: A partnership in transition. Sam Jones, ERCOT's CEO, followed Hudson by reviewing the history of ERCOT since it became the Federal Energy Regulatory Commission's first independent system operator (ISO) in 1996. As Figure 6 shows, between 1995 and 2005 total electricity delivered in ERCOT increased 30% from 230 million MWh to 300 million MWh. ERCOT may be proud of its success in creating choice for industrial, commercial, and residential customers, but plenty of challenges remain. The major near-term challenges are the aforementioned shrinking reserve margin and the dominance of natural gas (which currently fuels 72% of generation capacity) within the fuel mix (Figure 8). As Figure 7 shows, ERCOT expects its reserve margin to fall below the targeted "Safe" level sometime in the 2007–2009 time frame. Although project development activity has picked up, advanced development (as measured by the number of executed interconnect agreements) is lagging. Most of the advanced development is gas-fired, exacerbating the existing fuel-diversity problem. For this reason, ERCOT is establishing better incentives for voluntary load reduction by customers to reduce on-peak demand. Some interesting opinions were voiced by Tom Payton, VP for power at Occidental Energy Ventures. Payton challenged ERCOT to take leadership in the policy change arena and "not behave like a regulated utility" by simply taking direction from the PUCT. ERCOT needs to be a proactive leader, not just a facilitator, he said, adding that he feels ERCOT caters too much to stakeholders. "Stakeholders should not decide policy. ERCOT's board should work for consumers," Payton advised. Another hot topic was capacity payments. Currently, there is no payment for capacity in ERCOT, only for energy. It was noted that among the nine ISOs in the U.S., only two (ERCOT and MISO) offer no installed capacity or locational installed capacity payments. Wind power in Texas. Texas is moving aggressively to increase the share of renewable energy in its generation mix. Indeed, this year it overtook California as the state with the most installed wind power capacity. During 2005, the Texas legislature passed Senate Bill 20 (SB20), which established renewable capacity goals of 5,880 MW by 2015 and 10,000 MW by 2025. About 95% of the renewable capacity is likely to be wind power. But although it takes only one or two years to develop and build a wind farm, it takes five years or more to install the associated transmission capacity. SB20 includes a program being called Competitive Renewable Energy Zones (CREZ) to give priority for transmission funding to the sites with the best wind power potential. The PUCT is planning to fund up to $2 billion in transmission improvements to make sure that the renewable power gets to market. Projects will compete for transmission access. Developers would have to put up deposit money to reserve transmission space. Developers, however, are already complaining that, although they must submit a completed interconnect agreement (accompanied by a deposit) at the front end of a project, financing won't become available until a "certificate of convenience and need" (CNN) is obtained. Developers would like not to have to submit the deposit until receiving the CNN. Two other concerns of developers are that gas- and coal-fired projects will try to grab the allocated capacity and that one well-funded wind developer might try to hog a large proportion of the new transmission. Resource adequacy in an energy-only market. At the GCPA annual meeting, there was a spirited debate among panelists suggesting the best market design to stimulate demand response (DR). Dan Gabeldon of Booz Allen Hamilton lamented the use of price caps, which usually are arbitrary, to create "missing money" from a free market that rightfully belongs to owners of peaking capacity. Steve Winn of NRG echoed these remarks and noted that, even without a cap, peakers normally quote below the true market price due to the bad image created by someone looking to exploit a supply shortage. Bill Bojorquez, director of system planning for ERCOT, felt that it was already too late to build and connect any new generation to avoid the reserve margin shortfall projected for 2007–2009. The only viable near-term choices, he said, are to unmothball capacity or come up with a DR program . . . immediately. Trudy Harper of Tenaska presented her straw man DR proposal. In her scheme, each seller of electricity serving a real load would be responsible for arranging an additional 12.5% capacity. At the end of each month in which the reserve margin was less than 12.5% at the hour of peak demand, a penalty would be assessed the providers that did not have 12.5% reserve, and the money would be paid to the providers that did. Harper said that because an energy-only market would lead to capacity shortages, only a properly managed DR program would provide the needed capacity more cheaply than building new plants. Nat Treadway of Distributed Energy Financial Group noted that, of the 1,800 MW of interruptible load in ERCOT today, about 1,150 MW are available at any moment. Other regions in the U.S. have done a better job of creating a competitive market for DR, he said. Another panel of technology experts pointed out that the infrastructure needed for a robust DR program would consist of intelligent meters with two-way communications capability. They added that the installed cost of a smart meter to a residential customer is in the range of $100 to $150—that is, if the program is implemented at full scale, not customer by customer. Superstar panel discussion. 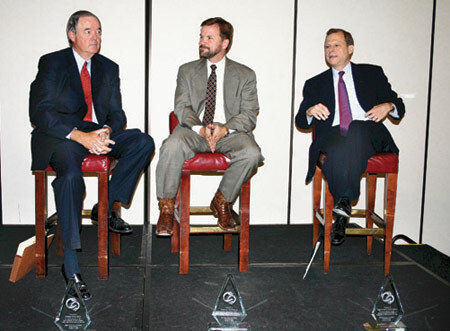 Three of the people most responsible for creating and nurturing deregulation in Texas were presented awards by GCPA Executive Director John Stauffacher. They were: David Sibley, former Texas state senator; Steve Wolens, former Texas state representative; and Pat Wood, former chairman of both the PUCT and FERC (Figure 9). In his remarks, Wolens recalled traveling to California in 1997 with Sibley and Wood to learn what not to do. They came up with the concept of the "price to beat" during another road trip to Pennsylvania and still consider PTB the bedrock of ERCOT's success. The California PUC told them, "Be sure to spend money to educate the customers." Texas spent $18 million in 2003, but funding was slashed to $1.5 million per year thereafter as state budgetary pressure took its toll. Wolens noted, "We've come a long way, but there still isn't enough difference in the prices offered by the many retail providers. We haven't seen one company emerge with a truly unique approach and become the 'Southwest Airlines of electricity.' "
Sibley recapped the primary goals of Texas Senate Bill 7: To transfer risk to the seller and empower the consumer. He said he wished that he would have saved the napkin used to scratch out the PTB structure on the trip home from Pennsylvania. "One of the best things about the model is that the market moved us to plants that are more efficient," he added. Wood (see box) rattled off a list of things that, with 20/20 hindsight, would have produced a better outcome. He said he felt that the march to deregulation was weak on innovative technology. Like Wolens, Wood agonized about the budget cuts for education needed to teach consumers about the market and their choices. The market design failed to account for negative stranded costs and did not envision the need to index the PTB to the cost of fuel. Also, there was not enough emphasis on tying ERCOT to adjacent regions in Texas. Wood is a big fan of the nodal market's promise for relieving congestion, perhaps first at the wholesale level, then retail, and finally at the neighborhood level. Wood said he's amazed that the prediction of 40% market share loss by incumbents in the PTB program was, in fact, very accurate. POWER magazine Contributing Editor Mark Axford sat down with Pat Wood, former Federal Energy Regulatory Commission (FERC) chairman, at the Gulf Coast Power Association for an exclusive interview. Among the topics discussed were the slow growth of new generating assets and the fast decline of system reserve margins. POWER: Given the projected drop in ERCOT [Electric Reliability Council of Texas] reserve margins to below 12% in 2007–2009, what actions would you suggest to alleviate the short-term aspects of this problem? Wood: I think the one clear option is to reactivate the mothballed plants. They were mothballed when there was the generation glut in the past six years. I think they should be reactivated wherever it's possible. Obviously, those that were truly "deep six" mothballed will be impossible to reactivate. What's more, I think there were about 10,000 MW of relatively old gas plants that were so inefficient they shouldn't be resurrected. But until we can get either new gas plants or some more wind farms or even coal plants built, I think "unmothballing" is the way to go. At the same time, realize that I've always been a big fan of energy conservation. I understand that Texas is one state where conservation doesn't pop into people's minds on day one. But it may make a lot of sense here, since we have a lot of price spikes in the market. ERCOT has a decent "load acting as a resource" tariff that has been a pretty good wholesale [demand response] program for economic price signals. POWER: What are your general thoughts about demand reduction incentives and incentives for incremental capacity—for example, gas-fired peakers and diesel reciprocating engines? Wood: Well, I think the best incentive is giving someone a decent price in the market if the market is tight. I don't favor any sort of incentives that would put all that back into ratebase. We fought so hard to get that out of ratebase during the 1990s. Regarding the capacity market, at FERC I voted for quite a few of those [incremental capacity projects] and encouraged people to do them. But I think the energy market price signal in Texas is robust enough to send a signal. Now, I won't pay for the full fixed cost of those [projects] by any means in a normal year. But in a tight year, you could recover a scarcity capacity payment as well as a normal energy payment for recips or small, simple-cycle gas turbine peakers. Those are the only reasons that you might need a capacity market in Texas. Do I think we're there yet? Two years ago I didn't, but I think the price signals that have been sent by people looking ahead to the market this time around seem to be working. People are already in the process of reactivating some of these mothballed plants, which is the same thing as building new simple-cycle plants because that's what the old gas peakers are. But the problem with those plants is that they're not efficient. So I think once a coal plant or even a few new combined-cycle plants come on-line, those units will be mothballed again. I think in the next couple years as [supply/demand] gets a little tighter, those units will be good bets. But the guys who"ll be doing them will be doing them on speculation that they can recover their costs from the energy market. Two years ago, I didn't think the energy market was sending that good of a signal, but I have since changed my opinion. In other words, I don't think a capacity market will be necessary in Texas as long as sufficiently strong price signals get that investment. That's not necessarily true elsewhere in the country. But ERCOT is more of a market than some of these other places are. POWER: Is there a way for ERCOT or the Public Utility Commission of Texas (PUCT) to require munis and co-ops to offer choice to customers? If you think so, should we move in this direction? Wood: Actually, that has got to be done by the legislature. One of my regrets is that the benefits of Senate Bill 7 were not made available to everybody. A pretty clear part of the bill is that adoption by munis and co-ops is done at their election. There are a few exceptions, for example, if they change their service area. A few of the co-ops have been required to offer choice, but that's because they wanted to change their boundary lines. But most munis and coops have not opted in. POWER: Should munis and co-ops in Texas be allowed to sell to retail customers outside of their franchise area? Wood: I think if they've opened up, they should be. But if not, probably no. I don't feel really strongly about that because generally the more choices customers have, the better. But I also think there is a certain equity issue here. If it's good for you, it ought to be good for them, too. POWER: With 20/20 hindsight, what would be the two most important things you would have done differently during your tenures at PUCT and FERC to improve electricity deregulation? Wood: In Texas, although it really happened after my period, maybe we should have nailed down the commitment to funding customer education for a number of years. Because they ended up pulling the funding back to balance the budget right when the market opened. That was very unfortunate timing. I think educating customers how to take advantage of the free market [is essential to its success]. On the FERC side, it would have been nice to have more than 24 hours in a day. When I look at how much effort it took to focus on opening the Texas market and then add 47 more states to that. . . . I feel like we got California back on the good path, which took a lot of effort. We got the Midwest and PJM going in the right direction, but we didn't get finished out West and didn't get finished in the Southeast. I wish I could have kept gas prices at $2.50, but that was outside of my jurisdiction. I do think the runup in natural gas prices made it more difficult for new states to initiate retail competition. We saw those negative stranded costs. You know we always wanted utilities to be able to recover their positive stranded costs. But if a utility had a plant that was worth more in the market than it was in ratebase, quantifying that and giving customers a credit related to that would have been difficult to do because that would have made [the utility] indifferent to customer choice. In other words, the utility would be getting a credit against a higher market price that would bring them back down to something that looked like its embedded price. But that's a tough sell, and the commission couldn't sell it in Texas. Only a few utilities in Texas had what were perceived to be surplus generation of value. And history has proven that to be about right. But out in the rest of the country, lots of coal and nuclear assets are worth more today than they were in 2000. No regulator in his or her right mind should let those go without giving ratepayers some sort of offsetting credit.